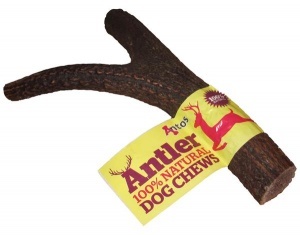 The Antos Antler Natural Dog Chew comes from a sustainable, natural resource. This dog chew comes from the red deer and is full of the calcium and minerals your dogs need. The extra-large dog chew helps strengthen and clean teeth while satisfying your dogs urge to chew. It is odourless and creates little mess when chewed. The Antos Antler Dog Chew is natural so no two antlers are the same; the colours vary from dark brown to a softer greyish/white, and the size and shape may vary.